Map produced from the Ordnance Survey Get-a-map service. Images reproduced with kind permission of Ordnance Survey and Ordnance Survey of Northern Ireland. The NERC MST Radar site (52.42°N, 4.01°W; British National Grid Reference SN 637 826) is situated near Capel Dewi, 6 km to the east of Aberystwyth in West Wales, UK. 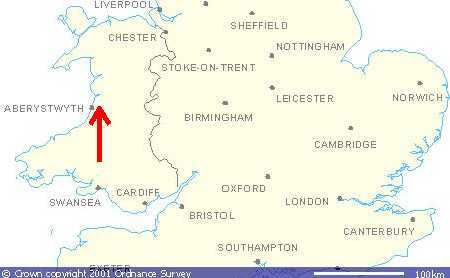 Its location is indicated by the red arrow on the map above. Page maintained by David Hooper. Last updated 29th June 2004.